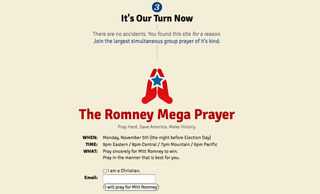 What would happen if everyone prayed for Mitt Romney? But one very rational Christian (with a flair for website design) who says he’s accepted the fact that, based on polls, Obama will likely win a second term as president next Tuesday has a plan: a giant mega prayer party, backed up by SCIENCE. WELL, legitimate studies that show the healing effects of prayer tend to conclude that people who pray are less anxious and depressed, which means that they have lower blood pressure and healthier, less-stressed hearts. No one who prays, regardless of how awesome they are at praying, is healthier because someone up there is rewarding them for thinking about Jesus et al. Also: the last study he’s referring to actually concluded that “the methodologic limitations of several studies make it difficult to draw definitive conclusions about the efficacy of distant healing.” But, psh, details. OF COURSE. These are facts, people.